News That I Am Shocked That I Haven't Heard More About! Zachary Quinto, who plays the serial killer Sylar on NBC’s Heroes, has been confirmed in the role of Spock in JJ Abrams’ Star Trek film. Here's how to make your own resin cast Green Lantern ring. This a complete overhaul of my original instructable on how to make a Green Lantern ring, which previously only showed how a cast sterling silver ring is created. Since many people don't have access to silver casting equipment I decided to show how to cast a ring in resin and also how to make a translucent resin version that glows. I'm still showing how a silver ring is made for those that are interested in the process and have access to the necessary equipment. In case you haven't noticed, I am a Doctor Who fan. But not in the bad way. As any true Whovian knows, every time you think the Doctor is good and dead, he'll regenerate and come back at ya. 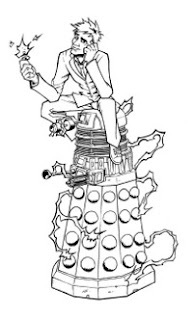 Why shouldn't the comic based on everyone's #1 Time Lord be any different? Much like the TV show in the U.S., the history of the Doctor in comics had him fading in and out of the public consciousness. His first appearance in the funny pages was actually in 1966, when Dell did a print adaptation of the two Who movies under the title of Dr. Who & The Daleks. In the meanwhile, a newspaper script of the Gallifreyan would appear in the UK, which Marvel then collected in a 1981 issue of Marvel Premiere #57 (with Tom Baker as the fourth Doctor). It also apparently included some sketches by Dave Cockrum and historic text by Jo Duffy. The federal trademark infringement case over the ownership of the comic book character Red Sonja has been rescheduled. Red Sonja LLC, owns the rights to the red-haired 'she-devil with a sword' character that was created as a contemporary of Conan in 1973 by comic book writers and was featured in a 1985 film with Brigitte Nielsen and in her own comic book line. From the Developer of the Open Core System and co-designer of Pulp Fantasy, comes a lighter take on role-playing games...Open Core Quick. 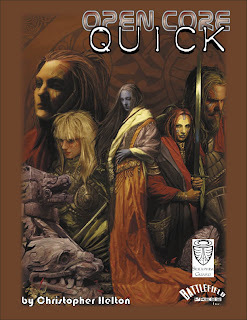 Produced in conjunction by Seraphim Guard and Battlefield Press, Open Core Quick takes the best elements of open content and boils them down to their essence, creating a system that is fast to play, easy to learn, and robust. While intended for at least one experienced gamer, a game master could easily teach the basics of Open Core Quick to inexperienced players in order to create characters and get a game started in minutes, not hours. Extensively playtested by gaming groups in the United States, the U.K. and Iceland, this game is not just some quickie system released to the public. While based on the popular Open Core System, this game has been streamlined for ease of play, and designed for player character-centric game play. The characters are the important part of the story and the players are able to mechanically effect play through their choices. While gamers with experience with the Open Core System will be able to play this game with little effort, some conversion will be necessary for characters between the two systems. Also contained in the .zip file of Open Core Quick is a short PDF called Guns and Money which features rules for Wealth, Money and Weaponry for the Open Core Quick rules. Everything needed to get play going is included in this .zip file! Open Core Quick is 48 easy to learn (total) pages plus the OGLs. Only $5, and available from, RPGnow.com. Image Comics' newly remastered collection of Jack 'The King' Kirby's Silver Star hit stands a couple of weeks ago. Image also has plans to publish a completely recolored one volume graphic novel collection of Kirby's 14 issues of Captain Victory later this year. Announced at the Kirby Tribute Panel at Comic-Con International: San Diego today, Image and The Kirby Estate have entered into an agreement to produce new series based on two of Kirby's final creator-owned properties, originally published by Pacific Comics in the early 1980s. Also in the pipeline is a collection of completed-but-unpublished Silver Star mini-series by Kurt Busiek, along with Busiek and Neil Vokes' Teen Agents mini-series. It's the final nail in the coffin of the Free Press here in America. Just kidding. Publisher American Media Inc. said on Tuesday it will stop printing the Weekly World News, which for 28 years gleefully chronicled the exploits of alien babies, animal-human hybrids and dead celebrities. The company said in a brief statement it would end the print version of the tabloid newspaper next month but would maintain the online version (www.weeklyworldnews.com). 'Due to the challenges in the retail and wholesale magazine marketplace that have impacted the newsstand, American Media, Inc. today announced it will close the print version of the Weekly World News, effective with the August 27 issue. Weekly World News was AMI's smallest weekly publication,' the company said in a statement e-mailed to Reuters. Spokesman Richard Valvo declined further comment. American Media is headquartered in Boca Raton, Florida, and is best known as the publisher of the National Enquirer. The company announced last month it was exploring the sale of five of its 16 magazines as part of a strategy to focus on celebrity weeklies and lifestyle magazines. The Weekly World News, which boasted it was 'The World's Only Reliable Newspaper,' reveled in shocking and almost always exclusive reports about extra-terrestrials, ghosts, scoundrels and scientific discoveries, such as the cure for lovesickness found on the walls of an ancient Mexican monument. 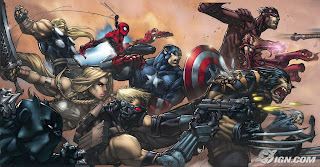 This art comes to us via IGN.com. Well, we knew a third Crisis was coming because of the not-so-subtle hints, and the fact that Countdown has to be counting down to something. DC Comics has provided Newsarama with the following image (by 52 cover artist JG Jones), and offered no further comment. I'm really not sure if it would have been any better, but Tom Brevoort is posting Mark Millar's original pitch for Marvel Comics' Civil War event on the Marvel website. Mostly this is being posted so that people can see the process of how a pitch is turned into a book. As I mentioned on Friday, this week I'm planning on posting a series of documents from the making of CIVIL WAR, since people seem to be interested in that, and since the earlier series on HOUSE OF M was so well-received. So that's what you all have to look forward to in the days ahead. To start with, here is the first document written by Mark Millar outlining his initial ideas for CIVIL WAR. This was done immediately after the creator conference at which the initial ideas for CIVIL WAR were thrown around, and you'll see Mark make reference to some of those conversations herein. Also, the version I've chosen to upload has notes incorporated into the body of the text from both Joe Quesada and myself, so you can get a sense as to our innediate eractions to the specifics of what Mark was proposing. And because I can't seem to do different colors in this blog, the Joe comments are labeled JQ, and my comments are labeled TB. Here's a montage of some of the photos that I was able to take before the batteries in my camera died. Sorry there weren't more of them. I wanted more pictures. Here's a link to the photoset. This September marks 50 years since Jack Kerouac's On the Road hit bookshelves, stirred controversy and spoke — in a new voice — to a generation of readers. Today the beat travelogue continues to sell 100,000 copies a year in the U.S. and Canada alone. Legend has it that Kerouac wrote On the Road in three weeks, typing it almost nonstop on a 120-foot roll of paper. The truth is that the book actually had a much longer, bumpier journey from inspiration to publication, complete with multiple rewrites, repeated rejections and a dog who — well, On the Road wasn't homework, but we all know what dogs do. But the scroll: That part's true. Jim Canary, the Indiana University conservator who's responsible for its care, says Kerouac typed about 100 words a minute, and replacing regular sheets of paper in his typewriter just interrupted his flow — thus the scroll. But Kerouac's brother-in-law and executor, John Sampas, says the three-week story is a kind of self-created myth. 'Three weeks' is what Kerouac answered when talk-show host Steve Allen asked how long it took to write On the Road. Well, this is the final report of our trip to Origins. 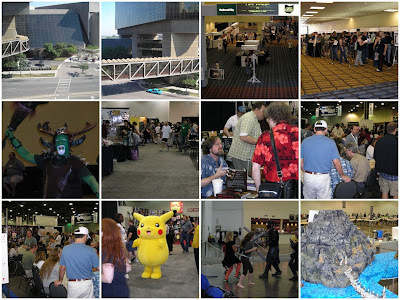 Sunday was pretty much: visit the Exhibitor's Hall one last time and pick up anything interesting. It was a bit disappointing that more of the publishers weren't having specials for the last day, but I guess they would rather just pack it up to GenCon. I do have to say that I was unimpressed with the quality of the Hawkmoon books that Mongoose was selling. I thought that the print quality was such that it was obvious that the book was POD, not to mention the fact that the covers were bowed because they used too much glue on them. Not very impressive over all. However, I was impressed yesterday. Brad Elliot of EOS Press offered a demo of Unhallowed Metropolis for Aren and I. The character generation was pretty easy, we managed to make two characters in about 20 minutes or so, and the simple combat that we ran through was pretty easy and quick. The game utilized a simple Attribute or Skill plus 2d10 versus a set target number for resolution. Like I said, quick and easy. In a lot of ways, the system reminded me of Unisystem. Which, frankly, isn't a bad comparison for me. The setting of the game came across and very evocative and interesting, and the ashcan copy that he had at the con was actually very nice looking as well. The only bad thing was that I couldn't actually preorder a copy of the book, which after the demo I really wanted to do. EOS doesn't offer preorders until the book is at least on the ship coming back to the States. All in all, I think a good way of handling it. This is something that I am now officially looking forward to however. Other pluses: I found a dealer selling EOS's Weapons of the Gods for $10. I couldn't really resist the price, and I've heard a lot of good things about it. Brad was also kind enough to sign it for me. Finally managed to find a copy of the Magic Box for the Buffy game, as well, so that was a good thing too. Overall, I saw some people that I hadn't seen for a while, met some nice new people, and had a pretty good time at Origins. It was a shame that the con was so much smaller this year. I hope that if attendance was down, it was only due to the registration problems with their website. I really like have a con like this in "the backyard" so to speak. It was a good time. Oh, one last thing. The batteries in my camera died on Saturday so I wasn't able to get as many pictures as I wanted and I can't upload them just yet either. Probably tomorrow. Well, yesterday was our first day at Origins. I have to say that I was a little underwhelmed with my first impressions. Really, it seems like the con's industry attendance has shrunk again. Last year, WotC pulled out (which considering they have GenCon and that stuff up in Wisconson I can understand why they might not have needed Origins) of the show but it really felt smaller this year. The exhibitors room just seems to be rattling around in all of that space this year. Maybe that is a good thing for those publishers and dealers who are there. I'm not sure, it just seemed to have gotten smaller. I played in a Call of Cthulhu game set in Tombstone. It was an interesting session, with a cool twist to the story in the end. Everyone seemed to have a good time about it. I did get to meet Matt Wiseman finally, too, so that was good. Ran into Brad Elliot of EOS Press as well. My reputation from RPGnet proceeds me, at least in a good way with him. I saw a proof for Unhallowed Metropolis (more information here), their upcoming Victoriana/horror game, and I have to say that it looked pretty cool. The art was incredible and it just sucked you into the world of the setting. He said that it would be a GenCon release, and I have to say that it is something that I think that I'm going to be looking forward to. Brad also offered an after-hours demo, so I will have to try to take him up on that. New Stuff Picked Up: True20 Companion and Mutants and Masterminds Pocket Players Guide from Green Ronin. They certainly had a lot of stuff in their booth. Afterwards, met up with Gary Mengle and some others at Barleys (a brew pub across from the Convention Center) and had some very excellent micro-brewed stout. Perhaps a little too much, but it was a fun night. Also ran into Dave Bellar at the bar (which was a bit of a surprise) and we're going to try to meet up today at some point. There's some interest in a Spirit of the Century game tonight, so that will probably take up part of the after-hours today. All in all, looking forward to Day Two. Doctor Who Companion Series 4: Donna says "I do!" Catherine Tate is set to return to the TARDIS for the complete 13 week run of Series Four of Doctor Who. Award winning comedian Tate will reprise her role as Donna, the runaway bride from last year's Christmas special, despite turning down the Doctor's invitation to travel with him at the end of that adventure. When Catherine was asked if she would like to become The Doctor's new companion at the press screening of The Runaway Bride, she replied, 'I would love to, but no one has asked!' Well, now they have. Because aerobics is the best way to teach someone what to say when they're being mugged. Thanks, Daiv! Doctor Who is to have a new companion when the drama returns - but there will still be room for his current co-star. Actress Freema Agyeman is to play Martha Jones in three episodes of spin-off show Torchwood. She said it was a chance to 'expand' her character. She will miss the first half of the fourth series of Doctor Who, but will then return to the BBC One programme. The new companion will be revealed soon and will appear in the entire 13-week run, which begins filming this month. It failed to bring Jim Carrey happiness in the award-winning film Eternal Sunshine of the Spotless Mind, but scientists have now developed a way to block and even delete unwanted memories from people's brains. Researchers have found they can use drugs to wipe away single, specific memories while leaving other memories intact. By injecting an amnesia drug at the right time, when a subject was recalling a particular thought, neuro-scientists discovered they could disrupt the way the memory is stored and even make it disappear. The research has, however, sparked concern among parliamentary advisers who insist that new regulations are now needed to control the use of the drugs to prevent them becoming used by healthy people as a 'quick fix'. I don't think that I can really add anything to this story. A peacock that roamed into the parking lot of a Burger King in New York City was beaten by a man who insisted it was a vampire. Animal control officials in Staten Island say the bird was beaten so fiercely that most of its tail feathers fell out and it had to be euthanized. The seven-year-old male peacock wandered into the restaurant parking lot and perched on a car hood last week. Charmed employees had been feeding it bread when the man appeared. Employees called police, but the man ran when he saw them.